Usually, when preachers come across two stories jammed together into one Gospel reading, it is a disappointment. A disappointment, because you can really only focus on one story in a sermon. And so you have to choose. Today, that choice would be between the Feeding of the 5000 or Jesus walking on the water. A story about abundance in the midst of scarcity. Or a story of a miracle meant to show us who Jesus really is. 6 years ago, this story was the text for the fourth sermon I had preached after becoming a pastor. I chose to focus on the feeding of the 5000, and to tell a story of encouragement… that despite a seeming decline in what we seem to be in as churches, that there is abundance in the midst of scarcity. That God is able to with incredible things with just a little, with 5 loaves and two fish. And this is most certainly true… and yet, the message of scarcity and abundance feels different today. Six years later, the challenges that churches like ours are facing across the country are much the same. They have been the same for a decade or two even. Yet, the longer we struggle with doing incredible things with 5 loaves and two fish, with doing more with less as churches… maybe we are missing the point. Maybe that second part of today’s story is more significant than it seems. The story of Jesus walking on the water speaks to us today at little more directly than the feeding of the 5000. Churches probably feel a little more adrift on the rolling and windy waves and less so like we are on the mountain top dealing with the nice problem of having too many people and not enough food. These stories of ‘Feeding the 5000’ and ‘Jesus Walking on the Water’ are powerful images on their own, but there is something about them, when taken together, that speaks to our current circumstances. Sure the disciples were afraid of the wind and the waves as they crossed the sea, but as we will hear more during the next 4 weeks, they were also just as confused by what had happened on the mountain with the 5 loaves and two fish. And think about it. It isn’t just the crowds on the mountain, it isn’t just Jesus appearing on the water… it is the experience of going from mountaintop high to stormy waters threatening to drag us under. If there is any part of the story that we totally get, it’s that one. It is the experience of not knowing why all those people were drawn to the mountain top, and then being tossed into the storm before sorting out what 5 loaves and 2 fish really mean. We have been talking about decline and change for years now… and still the need for us to face these issues has never seemed more urgent than today. And it will be even more urgent tomorrow. Yet, most of us, maybe none of us, have really had the chance to understand where we have been. We haven’t had the chance to really reflect on why the crowds came to the mountain top. The story of Lutheran churches in the past 100 years has been one of small faithful, mostly rural communities planting small churches around 100 years ago, and then experiencing incredible growth about 50 years ago and today experiencing decline. And that is why we understand the disciples’ predicament. We know what it is like to be on the mountain with the hungry but happy crowds. And we know what it is like to be on the stormy waters unsure of where we are going or what God is doing. But we really know what it is like to come tumbling down the hill only to land in a boat set adrift on stormy waters. 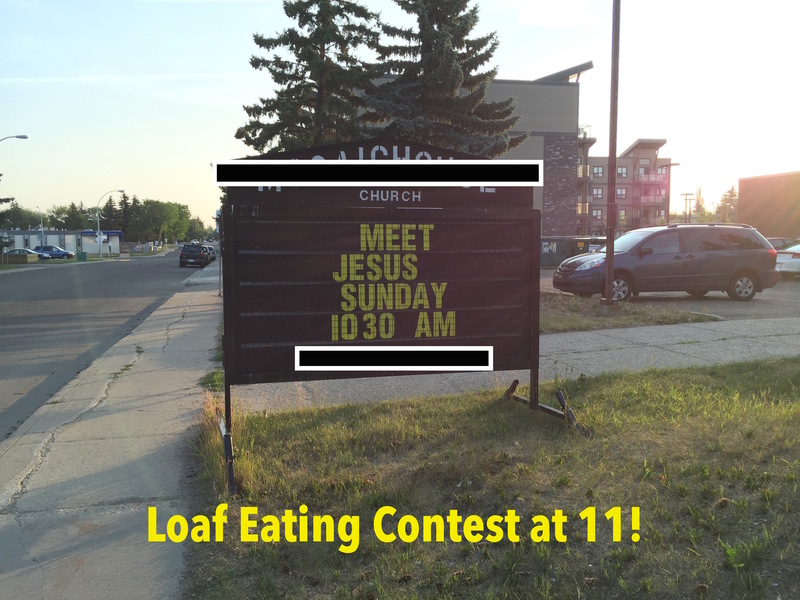 This is the story of Lutherans in Canada. As the wind blows the disciples across the sea, they were still struggling to understand what happened up on the mountain… and then Jesus strolls by, walking on the water. And if the disciples haven’t figured it out yet. And if we haven’t figured it out yet. Whatever miracle was happening on the mountain, it is here in the midst of the wind and the waves that the real action is happening. It is here on the water that the spirit of God hovers over creation. And to underscore that point, Jesus uses that name that God gives God-self when he is speaking to Moses in the burning bush. “I AM”. The water is where the Great I Am, where the creator is bringing about something new. The water is where God created all things and brought life into being. The water is where God delivered Noah and his family, where God brought the Israelites out of Egypt and into freedom. The water is where Jesus was baptized by John. And as we will be reminded as Deakyn is baptized today, the water is where God first meets us. So being on the water with the wind of the spirit blowing our boat somewhere new is exactly where God wants us to be. The mountain top is just a pit stop for us, it is not the destination. Yes, the 5 loaves and two fish can feed 5000, but most of the time they are only needed to feed five. The point is that God is feeding us, it is not about how many God can feed. The food is just meant to keep us going on the journey. On our journey where God is leading us from water to water, from bath to bath. Jesus comes to meet us on the water, because the water is where the action happens. The water is where God is creating something new. And as scary as the water is, as terrifying as the wind can be, as much as we want to go back as figure out the bread, fish and 5000 of the mountain top, God is dragging us down into the water, and God’s spirit is blowing towards something unknown, but something new. And, it is here on the water, here in baptism, here in the very foundations of creation that God finds us. And it is here in the stormy waters of creation that God is steering us to something new, steering the whole church, the whole body of Christ, into new incredible new life. The crowds are unavoidable today. Throughout the gospel of Mark, Jesus has been growing in popularity with the common people, the crowds. Jesus has debated and argued with the pharisees about the undivided house, he has surprised and terrified the disciples by calming the storm, he has broken down barriers by healing both rich and powerful Jairus’s daughter and the poor outcast woman who had been bleeding for 12 years. But today, it is the crowds who finally get what they want — and they want Jesus. The crowds are too much. They are chaotic and unrelenting. They are grabbing at Jesus and his disciples. They want more and more and more. There is almost too much to do, too many sick people to heal, too many exorcisms to perform, too many needs and too little time. The crowds are clamouring for healing… they are demanding something from an exhausted Jesus and his disciples. The disciples have just returned from the mission that Jesus sent them on two weeks ago. They are excited with stories of exorcisms and healing, but they are also tired. And they have gotten into the boat with Jesus to find a quiet place. Yet, the crowds still follow them along the shore. The crowds have one thing in mind. Miracles. They are looking for a miracle from Jesus, as if he was a heavenly vending machine. The vending machine God in the sky is an image for God that still persists today. In TV and movies, people turn to God when they need something. They offer up desperate prayers like quarters being dropped in a slot. Prayers prefaced by some admittance like, “If you are out there God, I don’t pray much, but I really need something now, so if you can just…” (fill in the blank). This is certainly a prevailing image of God in today’s world. And while as people of faith, we would like to think we are beyond such simplistic and self-centred approaches to God… we can get narrowly focused on God too. We can get bogged down by our need for healing, for an end to our suffering, for a fix for our brokenness. Our prayers can become self-centred and our relationship with God can become focused on relief and release from our problems. We look to God as individuals and as communities as the great band-aid dispenser in the sky. As the crowds are desperate for Jesus today, Mark tells us that Jesus has compassion for them. A word that evokes images of kindness and tender heartedness. A word that is more then gentleness and caring, but that truly means to suffer with. Jesus has compassion for them. But not for their woes and hurts and pains. It isn’t their blindness, or lameness, or sickness that moved Jesus. Jesus has compassion for them, because they are like sheep without a shepherd. And his response is to teach them many things. The Kingdom of God is near to you. Be transformed in heart and mind and believe. Jesus does not respond in the way the crowds were hoping. And Jesus doesn’t respond to our cries for healing in the way we hope either. Instead, Jesus sees our individual sufferings and needs as part of a larger problem. Jesus sees how we are all weighed down by sin and death. How the blindness of one is the same as the lameness of the other. And there simply isn’t enough to heal each one. And healing in itself isn’t enough. Even the ones healed by Jesus are dead now. Jesus’s compassion for us does not exclude a concern for our pain and suffering… but it is rooted in the fact that we are lost. We are shepherd-less. We need so much more than to be healed. As Jesus sees the crowds pressing in on him, as tired as he is, he has compassion on them. They are like sheep without a shepherd. They are focused on coming to God with our specific expectations. Their specific demands. Their need to be healed. Their need to be helped. Their desire to be fixed. They can’t see Jesus beyond their problems. And some days we can’t see Jesus beyond our problems. We aren’t just like the crowds. We are the crowds pressing in. We need a shepherd… and Jesus has compassion for us. And that means Jesus has come to give us what we need and not what we want. And what we need is a Shepherd who will gather us together. What we need us someone to teach us, to tell us of the Good News of God coming into our world. What we need is the intimacy and love of community. We don’t need our suffering to be taken away… because we know that it can never fully taken away. What we need is to know that we are not alone, that our suffering is shared. And that is what Jesus’s compassion is all about. It is not a magical cure for our problems, it is a not a televangelist bopping us on the head proclaiming that we are healed. God’s compassion is the word that cuts through our loneliness to join us to community. God’s compassion is the water of baptism that washes, cleans and clothes us with Christ. The water that gives us new life, new life found in the community of sheep who also bear the scars and healed over wounds of life. God’s compassion is the bread and wine of life, the meal that nourishes us for the Kingdom. The food that can only be shared in community, that is served at the Shepherd’s table for hungry sheep. God’s compassion for the crowds and for us, even as we press in on a tired Jesus, is about reminding us that the Good News is that we are loved. That we are forgiven, reconciled, and made whole in the One Body of Christ. As we press in on a tired Jesus today, God’s compassion means that we are no longer sheep without a Shepherd. So, now for something completely different on The Millennial Pastor. While on the one hand I agree with the concept of meeting Jesus in worship, putting this on the kind of sign usually used to advertise a sale at the corner store, I had to stop and snap a photo. Then my wife, Courtenay, started immediately thinking of captions. While aren’t trying to be mean or make fun, I think this could be a wealth of humour. And so I am now putting this photo out to you, the readers of this blog. Download the photo, add a caption and email it back to me at: Millennialpastor@gmail.com and I will add the best ones to this post! Or add a caption idea in the comments, I will add some of the best ones to the photo myself and post them here. Let’s have some fun with this! This story is one of the most uncomfortable for Christians to hear, even among some of the very difficult parts of Jesus’ story that we tell. More uncomfortable than death, than conflict, than sin. We don’t like this story because it doesn’t reflect how we experience the good news and church for the most part. The first half of the reading sets the stage for our discomfort. Jesus goes to his hometown and is ridiculed and his message isn’t even heard by those he is trying to reach. And with that rejection in mind comes the really scary part. Jesus sends out the disciples to meet people, to be welcomed by them and to reach them with the good news. To be evangelists. And if we are honest about our feelings with this story, the images of well dressed mormon missionaries and Jehevoh’s Witnesses knocking on our doors come to mind. People who make us uncomfortable when they come to us… and now we are supposed to imagine becoming just like them. Jesus wants us to go our door knocking so that we can enforce our religious views on others who probably aren’t interested in religious conversation? Doesn’t Jesus remember the part right before where his own friends and family reject him as a preacher? Shouldn’t they be the most supportive? For a lot of Christians, the prospect of going out in the community, into the world conjures up feelings of hesitation, disdain, discomfort, uncertainty. And it is not surprising that we feel that way given our recent history. For the last 50 years or more, Christianity hasn’t needed to do local evangelism. Evangelists and missionaries were people we sent to far away lands. To the tribes of Africa, to the heathens of the middle east, to mysterious peoples of Asia. And even still when we did to large scale evangelism at home, it was in the form of residential schools with the intention of taking the savage out of the Indian. For a long time, the evangelism that most christians and most local churches have done is to welcome people who are already Christians into our established communities. People who have recently moved into town, people who have immigrated from other Christian countries, people from other churches, usually of the same denomination. And yet in the past few years, the world changed. Most people stopped being Christian. Many people began drifting away from church. And today, most young adults have almost no experience of church at all because their parents stopped going when they were young adults. And yet we as local churches and church leaders kept operating like all we needed to do was to be ready to welcome existing Christians into our communities. We are well structured to receive Lutherans looking for a Lutheran church with a Lutheran Sunday School, Lutheran Choir, Lutheran confirmation program, Lutheran church council, Lutheran bible study and other Lutheran programs. When all the Lutherans looking for an established church come to town, we will be ready. Yet, we all know that isn’t going to happen. So it is n wonder that the idea of being sent out to spread the gospel is uncomfortable for us. We have been trained and structured to be ready and waiting here for people to come to us. And again, it is no wonder that this story of Jesus sending out the disciples is scary for us. Because when we really think about ir, Jesus sends the disciples out to be guests – not hosts – to those that they are reaching. Yet, the only way most churches try to reach those in need of the gospel is by being host. As the disciples are sent out by Jesus, they are sent to be beloved guests. They are sent to meet people in their territory. To meet people in their comfort zones, on their turf. They are sent to be guests receiving and accepting the hospitality of others. That is what the whole dust on the feet thing is about. A good host in that culture would wash the feet of guests. And so dust still on the feet would be a sign that the disciples had not been received with proper hospitality. Being a beloved guest is not easy. To enter into the space of another. To go with humility. To give up control and to meet the other on their terms. It is a relational act. Unlike churches where hospitality is often the set up to ask visitors to join the congregation, to sing in the choir, to teach Sunday School, to serve on a committee… as a beloved guest, hospitality is something received. The disciples receive hospitality and in exchange offer good news. They offer the good news of relationship, the good news of God’s great love for us, the good news of Jesus Christ – God come to us in flesh. As difficult as this story is for us, as uncomfortable as we are with the idea of being sent out… we are asked to consider a few things. What would hospitality without an agenda look like for us in the church? What would our hospitality look like if rather than hoping for another warm body with a pulse to join our ranks, that se looked upon guests as people sent to us with a message of God’s love? A what would it look like for us to be beloved guests sent to receive the hospitality of others? Sent to offer the good news as thanks and gratitude for the welcome and generosity we receive? Jesus is calling us to radically new and different ways of being people of faith. It is one that we haven’t been prepared for, kind of like the disciples who are sent without much to take on their journey. Jesus is calling us to a new way of being disciples but also to an old way. Jesus is calling us to reach out to the people around us, the people outside of our comfort zone, outside of the community that gathers under this roof, to reach out in relationship with the good news. And yes, being a guest, a beloved guest, is scary. It will mean we are not in control, it will mean we don’t get to operate on our terms, instead will have to abide by the terms of those whom we are tying to reach. And we will not feel ready or prepared for this task. But just as the disciples discover as they preach transformation of mind and soul to those that they meet, we too will discover that Jesus is enough. That the good news is sufficient. That God’s love and forgiveness for sinners like us is enough. That God’s new life for people dead and re-born in baptism like us is enough. That God’s welcome and hospitality this table with bread and wine given us for us enough. These things are enough to allow us to be beloved guests sent to reach the world. They are enough to allow us to receive the beloved guests sent to us with messages of God’s love. Jesus is calling us into a new yet familiar world. One that resembles the world of the disciples more than it resembles our recent past. And the reception we receive might be rejection. And we might have to shake off the dust of our feet… and yes this is not something we are used to and it puts us outside of our comfort zone. But even scarier will be when we are received with hospitality and welcome. Even scarier will be when hospitality is extended. Like the visitor who comes to us searching for something more, searching for the presence of God among us, we too will find the presence of God among those who receive us. Just as we are washed and fed by God here, we will be able to faithfully name that the washing and feeding we receive at the hands of others is God’s presence out in the world. Evangelism, going to the world, forming relationship with those who don’t know yet of God’s love for the world is daunting and scary… maybe one of the scariest things we will consider as Christians. But it is also where Jesus is sending us. And the good news is, as we go out, Jesus will be all we need. The ‘Millennials and Church’ thing has been written about to death in recent years. Theories about what millennials want in church range from the newest, flashiest most technologically advanced thing to the oldest, most artisanal traditions. If you are sick of reading about how to get millennials back to church, join the club. In fact, I wouldn’t blame you for not reading yet another blog post about the topic… but bear with me, I promise not to talk at all about what millennials want or how to get us back to church. That being said, figuring out millennials is big business for Christianity these days… and finding the magic bullet to get us all back to church would make someone rich. Lots of church consultants and ministry experts are making the speaking rounds telling the church all about millennials and the big “change” the world is experiencing. And yet, as a millennial myself, I am rarely asked why I didn’t follow the rest of my exiting generation… and when I am asked why I am still around, it is usually after I have pointed out that I am rarely asked. The experts have more sophisticated reasons like people being busy and carefully choosing how to spend their discretionary time. Yet, none of these things seem to really name the reason that my contemporaries are not going to church. None of these reasons seem sufficient to explain my anecdotal experience. Admittedly, I have never had parishioners my own age in the last 6 years of ministry. Yet there is one area where I have consistently done ministry with millennials. I have met with dozens of millennials who are bringing their babies to be baptized, but who don’t otherwise go to church. Since, I require that I meet with them for friendly conversations about baptism, I have the opportunity to ask about the role of faith in their lives. Even though I fit the big teddybear-like white-guy-with-a-beard mould of the stereotypical pastor, I don’t fit the age mould. And I don’t talk about faith like they expect me to. And I tell them way more about baptism than their parents, grandparents or my predecessors have. Almost always, the millennials I meet with find it refreshing that I didn’t just expect them to magically know everything about church and that I encourage questions and skepticism. While the first takeaway is troubling, the bigger takeaway when I meet with other millennials (even ones that are almost completely unchurched) is that I don’t have to make the cultural commute that I am constantly making with most of the people I serve. What is a cultural commute you ask? Well, it is the whole “iPhone pastor for a Typewriter church” thing. It is the idea that in order to engage or interact with a certain community or group of people – or generation of people – you need to speak in their cultural language. An easy example is actual languages. Even though I am an English speaker, I took grade school in French. It was draining to operate in a second language all the time. It is the same for immigrants and foreigners, even when they already speak English. You don’t just speak the same language, you learn a whole system of symbols, images, colloquialisms, inside jokes, history, and baggage that go along with a group of people. And when you don’t get that culture, you feel constantly like you are on the outside. I remember when I first got my iPhone and would pull it out to make appointments or send messages in front of parishioners. They would often look at me like I just beamed down from the starship Enterprise; these were people who remember riding to school in a horse and buggy. But more than that, when I sit in most meetings or conversations with church people, the discussion ends up being full of cultural references that pass me by. TV shows, music, movies and historical references from the 50s, 60s, and 70s, of which I don’t understand the meaning, are regular parts of conversation. While at the same time, I have to park my cultural baggage. I can’t make Friends or Breaking Bad or Jay-Z or Mumford and Sons or Hipster or Twitter references because most people won’t get them. But it isn’t just pop-culture symbols. It goes deeper than that. It is the whole way church and faith were approached 50 years ago versus how things are approached today. The most draining cultural commute that I experience as a millennial pastor is the difference between congregations who still expect that every good Canadian (or American) citizen would be a church goer versus my expectation that only people who are interested and for whom faith is very important would be a church goer. When I go and talk to unchurched millennials about baptism, I often get asked about why faith and church is important to me. This is often is the most exciting part of the conversation. Yet, when I ask churched boomer and older members about why faith and church is important to them, I get uncomfortable looks and uncertain answers. I love the people I have served and do serve. And I don’t begrudge them this in anyway. If anything, this is a failure of church leadership to not help people think through why church is important to them. I also think that it is an important part of ordained pastoral ministry to be constantly making cultural commutes to those whom you serve in order that they might hear the gospel (wasn’t the whole incarnation a cultural commute?). But this cultural commute… this expectation that as a millennial I will always cross the bridge in the cultural gap and engage – work, speak and serve – in a world that is culturally different is not just because I am a pastor. Church people so often expect that anyone outside the dominant culture or generation – millennials, foreigners, seekers, new converts – will be the ones to make the commute. And often this expectation is unconscious. It is okay for a millennial pastor to be the one crossing the bridge, making the cultural commute in order to be a part of a church community. But it doesn’t work for millennial church members. And I think this is a big reason millennials aren’t in church. It just isn’t a world that most of us can even access. These are important issues, things we should talk about, things we should speak out about. But we aren’t talking about why people are leaving church. And we certainly aren’t talking about how to translate ourselves into a church for 2015 and beyond. Instead, we are talking about restructuring, and right-sizing… the corporate language of the 80s and 90s. I suspect that this is where a lot of conversations in local churches, in districts and national offices are going. Churches are trying to catch up to the 80s… while my millennial contemporaries are leaving churches because the cultural commute to even access church is just too far a journey. Yet I wonder as I prepare for this national gathering of my church body and as Christians across North America struggle with young people walking away… I wonder when we are going to start looking to the millennials still here to help us become a church for all generations faithfully looking forward into the 21st century. Until then, I will keep being an iPhone Pastor for a Typewriter church. PS Thanks to Nadia Bolz Weber for introducing me to the concept of ‘cultural commute’.